Tonight's red post collection features a look at Riot's new documentary Frequencies - The Music of League of Legends, a heads up that the Music team will be hosting a Q&A on January 29th, Fearless with additional context on the 5.2 jungle item changes, Hippalus sharing the most purchased skin, a look Tristana's update and a limited time bundle now that 5.2 is on live, info on the upcoming Refer-a-Friend downtime, and more! [UPDATED] 1/28 PBE Update: New Summoner Icon, Skin Tweaks, Kennen Texture rebalance, Symbols on SR, and more! Following the release of Music of the League Volume One and The Curse of the Sad Mummy earlier this week, Riot has released a Frequencies, a full length documentary on the music of League of Legends! 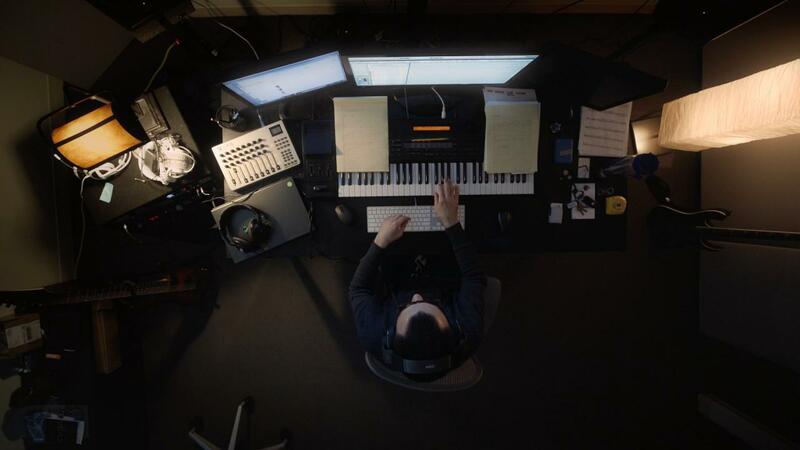 "Watch as the Riot Games music team forges orchestral sagas for the League of Legends universe through passion, collaboration, and the pursuit of creative harmony in the documentary Frequencies." "Music and games share an intertwined history stretching back to neon-soaked arcades and dusty living rooms crowded with tangles of twisting plastic controller cords. From chiptune scores to the sweeping symphonies of expansive fantasy worlds,the relationship shared between games and music simultaneously elevates both art forms. Frequencies is a behind-the-scenes look at that harmony at Riot; the moment when creativity, collaboration, and passion collide to forge and reinforce story through music." In addition to the documentary, the Frequencies page also contains links to the The Curse of the Sad Mummy, Music of the League Volume One, and Pentakill's "Smite and Ignite" album. "Fun fact: I recorded the Amumu tantrum screams on a Sunday, so nobody would be at work and think they hear someone get tortured in my studio"
 "Another fun fact: Dr Mundo is named after the concept artist Edmundo in our Frequencies documentary"
Following the release of Frequencies, the Music team will be hosting a Q&A on Jan 29th! "You’ve probably noticed that it’s been a busy week for music in the League of Legends universe. With that, we thought it’d be a good idea to round up a few of the Rioters behind the documentary Frequencies, the music video “The Curse of the Sad Mummy,” and The Music of League of Legends album for a little Q&A. "TLDR: We did a pretty poor job ensuring you guys got the full reasoning for why we were doing this, and I really dropped the ball here. I failed to ensure that our patch notes reflected the intent of these changes, nor did I give Pwyff and crew nearly enough info to make that possible for them. I'm here to give the full context and also talk about how these changes fit into our strategy around the jungle right now. So, the 5.1 "Smite with Charges!" change does a lot of cool stuff for the strategic freedom of the jungler, but we also knew that it would hit some of the same issues the Conservation mechanic had from season 4. Mainly, when you're not 'wasting' a resource with overflow, it creates very clear windows for the jungler to go do something else with a very low cost. In other words, a jungler waiting for Smite to come off cooldown can gank or go kill wards without feeling like they're making a deliberate trade for it. Combined with a few junglers that could grab a camp or two and then bring out very potent ganks, this meant that 5.1 created a situation where the optimal strategy for some of our most powerful gankers was to go back to their old habits of deciding lanes before laners had even hit level 2 (in some cases). Worst of all was that failing these ganks didn't really set these junglers behind, because many other junglers didn't have the ability to invade and punish them after the failed gank. The adjustments were made to hit this specifically, so that guys like Jarvan and Lee Sin had a bit more of a risky start if they tried this, as would Shaco, Xin, and Panth, even if they're not currently centered in the spotlight. We are aware that this change hurts some of the junglers with weak clears, leaving them with less gold for pots to stay healthy during their second clear. We know this is really painful when blind monks and dunking princes are taking over games. We know have a lot of work ahead of us. We've been making changes and adjustments to the systems around the jungle at a really high frequency, and that's largely complicated the work that could have been done on the individual items or the champs. We've already been having a lot of internal discussions about what we need to do as the dust settles on the systematic changes. The 5.2 changes happened because we know early gankers needed to be much higher risk, and the extremely cheap jungle items were a main contributor to their reliability. We still need to carve out more space for our tank junglers, and we are still trying to give junglers more reason to invade and counter jungle. These actions are one of the core reactions necessary to keep gankers in check, and currently aren't functioning at the levels necessary for healthier play. Can't say it enough, we have lots of work ahead of us still, and we're committed to making this better. 5.3 is already very tight for changes, so 5.4 is much more likely for the next round of changes." "Totes my bad on the context in the patch notes. Reading back on it, it definitely reads like we didn't acknowledge the full problem. Something to learn for the future definitely. As an aside, we talk a lot about making precise changes that directly target the problem - I think for this one we took a more broad approach that ended up 'hurting' a lot of junglers, even if it was more directly aimed at aggressive level 2 gankers (Lee / J4 / Shaco / Panth / Xin). We're aware, we're looking into it." "We knew the items enabled a pattern, a pattern that JarvSin ( Lee Vin?) we able to opt into, but it's not just them. The items created too low of a threshold for success for a jungler's first few minutes. The item adjustment needed to fix that issue with the system, and would need to even if those dudes weren't generally strong. Also as I posted, it's been very hard to make changes to individual champions while we're also making so many large systematic changes. Trying to get the systems of the game stable gives us a lot more space to hit the champs we need to it, and more excitingly, start bumping up the champs that we think we've pushed down with the system changes." "She's not! We talk about her very consistently in the design pit, and we know that she's probably the hardest hit. Can't say when we can get her some love, but she's not forgotten." In a reddit thread asking what the most sold skin in-game was, Hippalus swooped in to comment that Assassin Master Yi is the most purchased skin over all but PROJECT: Yasuo holds the record for most purchased skin during release! "Assassin Master Yi is still the most purchased skin overall due mostly to free RP. But the record for most skins purchased during release was set by a new skin in 2014. Any guesses? I'll tell you if the most upvoted guess is right or not. 1) Haha good one - maybe we'll make up for it in 2015. Or maybe not. 3) Not the winner of this prize, but it WAS the most played 2014 skin in my personal quest for challenger (which sadly fizzled out somewhere in gold)." Tristana Update Rocket Jumps onto live! 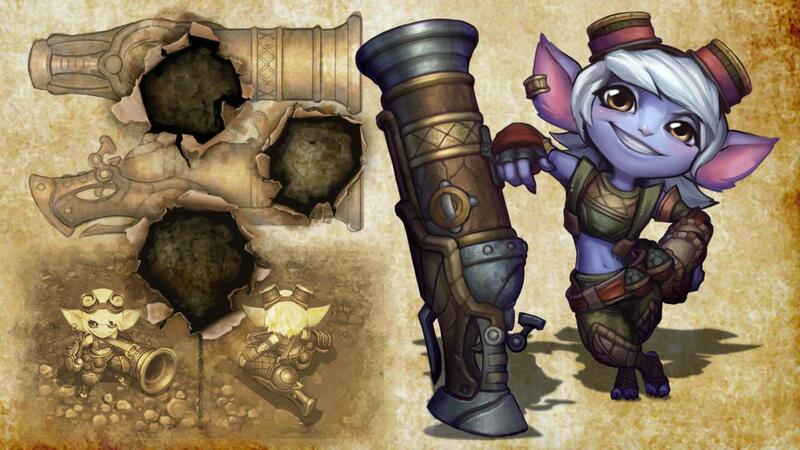 With the arrival of patch 5.2, Tristana's champion update is now available on live! Here's Fizznchips with the release announcement and information on a limited time flex bundle that includes her legacy skins! "After a brief stint on the PBE, Tristana’s ready to rocket onto Summoner’s Rift and show off her fancy new stuff. With redone models, textures and effects for all her skins, a new voice, and an explosively charged new ability, it’s a fairly fundamental update. Check out our recent PBE article for the full story right here, or just look below for some pretty pictures! Look closely and you’ll note this isn’t quite the full Tristana skin line-up. After asking around, it turns out Riot Girl Tristana was too busy gawking on social media at 2014’s top ten rockets (you’ve never seen anything like number seven before!) to turn up. Good thing you can still pick her up for free by heading to the League of Legends facebook page, eh? Excited to jump around with Tristana’s update? Let us know if the comments below!" For a better look at Tristana and her updated skins, check out S@20's coverage of her champion update! "We recently shared our plans to update the Refer-a-Friend program to better serve players bringing allies into League of Legends. We’ll be taking the current RAF program down for the transition. The downtime may last a few days, during which time we’ll transfer players to the new program, including handing out any new rewards earned as a result of previous referrals. We’re excited to launch the update to the Refer-a-Friend program—thanks for your patience as we implement all of the changes!" You can find more information on the upcoming changes here, including the greatly reduced requirements for earning Medieval Twitch and Grey Warwick. The League of Legends website is leveling up with a new login bar and options! "Hey everybody, as you may have seen on the Music of League of Legends promo page, we've got a bit of a facelift coming for the login bar that sits at the top of most of our League sites. Over the past couple years, we've expanded our web presence beyond LeagueofLegends.com. Though each of our sites serves a unique purpose, we could do a better job tying them together as a network. The new bar has links to all our major destinations: though this is a simple change, it's now much easier to move across League's web experiences. With these improvements to network navigation we're also paring down our navigational menus across the main areas of LeagueofLegends.com - in some cases removing them entirely or moving elements into the drop-down under your summoner name. While we were considering other valuable additions to the login bar, we pulled the ticker into the redesign. You can now quickly spot-check server status updates from the web in situations where you might not be able to access the patcher or landing page. You'll start to see the new login bar being rolled out over the coming weeks. Let us know what you think!"